If you have any Apple product or have ever been to an Apple Store you might have heard of AppleCare, when you purchase a new product from Apple you get 1 year of warranty and 90 days free tech support but this might not be enough, usually smartphones and tablets start to show problems after 2 years of use, so what do you do when you don’t have any warranty left but your device is broken? Meet AppleCare, an insurance policy for your iDevice. 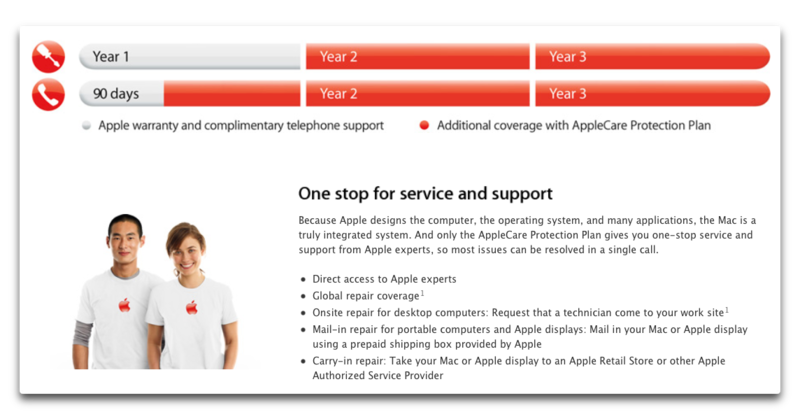 If you want to extend the warranty of your device AppleCare is the service to go with. There are several different plans for each device and country, lets take an in-depth look at how these work, how long they extend your warranty and how much they cost. If you purchase Apple’s insurance for iMacs of all sizes, Mac Pro’s, Displays, Mac Book Pro’s and MacBook Airs you will extend the warranty to as much as three years (an additional 2 years) and 33 months of phone support So when should i buy it? Well, For iMacs and Macbooks you can purchase it during the first year you purchase the product (while it is still being covered by its initial insurance) after the first year, you are unable to purchase AppleCare for it. So should i buy it straight away? Ideally you should buy it at the end of the first year of warranty, to get the most out of your Care plan. But if you don’t live close to anywhere were you can purchase it, you should get it once you buy the device. If you purchase Apple’s insurance for its iDevices like the iPhone, iPad, iPod and Apple TV you extend your warranty to up to 2 years. Similar to the plan for Macs, you have a limited time to decide if you want to purchase AppleCare, but instead of a year, you only have 30 days. Mac: It Gives you hardware coverage and software support (OS X, iLife and iWork). The price varies depending on the Mac or Macbook you have. Make sure to also check out our post on “AppleCare: Useful or useless?” Do you currently have AppleCare for your device? Let us know!